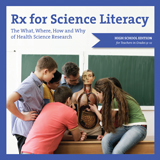 Rx for Science Literacy is bound in a three-ring binder, with pages designed specifically for photocopying. Receive a free copy by attending an NCABR in-person workshop that features this curriculum manual. Click here for the workshop schedule. 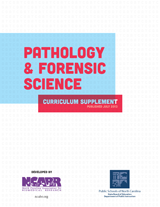 This supplemental curriculum manual of 190+ pages focuses on the wide range of career prospects offered by the fast-growing field of biomanufacturing. It’s the basis for Biotechnology Research and Careers, NCABR’s ongoing online professional development course for teachers from grades 6-12. The manual was updated comprehensively in spring 2014 to reflect a North Carolina biotechnology and biomanufacturing landscape that has changed significantly since the manual’s initial publication, in 2006. Since the manual first was published, NCABR has held numerous day-long professional development workshops to introduce North Carolina teachers to the curriculum. Workshops have been held at Biogen, in Research Triangle Park; Wyeth Pharmaceuticals, in Sanford; and North Carolina State University’s Golden LEAF Biomanufacturing Training and Education Center, in Raleigh. As part of a 2008 national science curriculum conference, NCABR also held a workshop that featured the manual for teachers from 24 states. In all, more than 200 teachers have participated in a related workshop, and more than 500 copies of the manual have been distributed to teachers through Career and Technical Education programs of the North Carolina Department of Public Instruction. 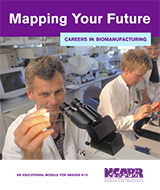 The Biogen Foundation and the North Carolina Biotechnology Center generously have provided funding to make Mapping Your Future possible. Each unit contains (a) a reference article that gives students an overview of the unit’s topic and (b) a student activity that is accompanied by a teacher activity overview. The curriculum supplement was created in partnership with the North Carolina Department of Public Instruction.